Senior day for swim and dive ended on a sour note as No. 14 men and No. 10 women fell to the No. 3 men and No. 7 Hoosiers of Indiana. IU downed the men 184.5-115.5 and the women 160.5-139.5. On the women’s side, Indiana took the first two events (200 medley relay and 1000 free) with U of L taking second and third. Junior Mallory Comerford won the first event for Louisville, the 200 free, with an NCAA-B Standard time of 1:46.81. The teams traded winning and placing over the next events, but Louisville gained a huge boost by sweeping the 50 free. In diving, sophomore Molly Fears placed second in both 1- and 3-meter dives. The Cards couldn’t overcome the big finishes from the Hoosiers as IU won five of the seven remaining events. For the men, junior Marcelo Acosta won the only event (1000 free) through the first 10 events. Acosta later won the 500 free with a time of 4:25.61. Freshman Daniel Pinto won the 1-meter dive and was the only Cardinal to place in either 1- and 3-meter dive. 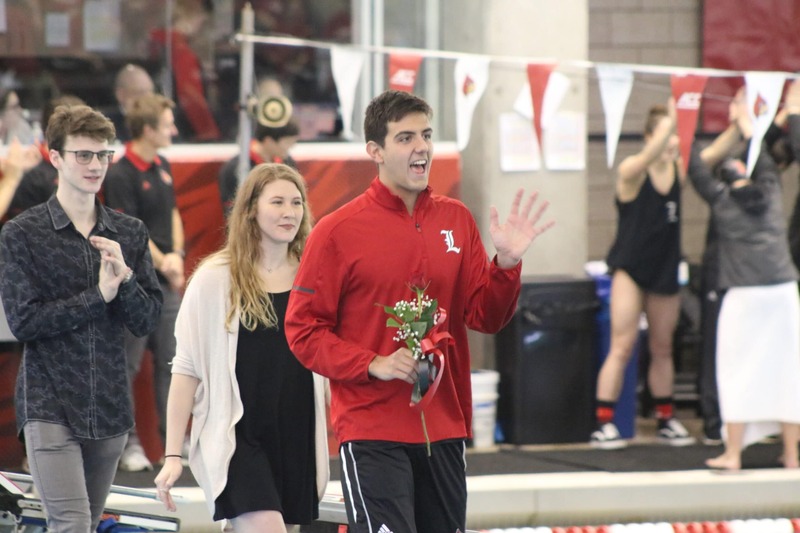 Prior to the meet, Louisville recognized seniors Carlos Claverie, Todd Owen, Jonathan Zoucha, Paige Ezell, Rachel Grooms, Lauren James, Ashley LeClair, Hannah Magnuson and Marah Pugh. With only one meet remaining (Louisville Invitational Feb. 10-11) before the ACC tournament, Albiero likes where his team is. “On paper, I think we look really good, but paper doesn’t swim. This can be our deepest team going into ACC play,” Albiero said.